Joan of Arc is one of my favourite women in history and her story is a fascinating one. Without any proper education, let alone military education, she lead the French army to victory during the Hundred Years’ War against the English — and to the crowning of Charles VII — as based on divine visions she received as a young teen. 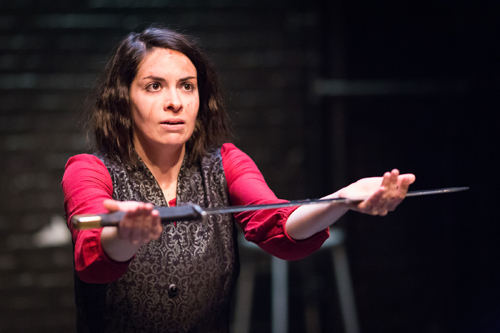 Soup Can Theatre‘s production of HERETIC is a mesmerizing one-woman show about the life of a young Jeanne D’Arc. HERETIC is a personal project for star and creator Sarah Thorpe, who wanted to explore the life of Jeanne D’Arc the peasant teenage girl as opposed to Joan of Arc the martyr. The production is a somewhat modern telling from Jeanne’s perspective. What immediately stood out for me was the way Thorpe made Jeanne relatable: often times her speech, mannerisms, actions, and personalities reminded me of a modern teenage girl. Her use of chalk to quickly and crudely leave phrases and illustrations to push plot points along on the stage floor, like a football play-by-play, added to her youthfulness and frenetic need to tell her story. It’s a lot of fun to watch Thorpe throw so much of herself into her performance. She plays not only Jeanne but Jeanne’s parents, a French army commander, the Dauphin (later Charles VII) and his mistress, the Bishop, and even the executioner all with quick costume changes. She interacts with different characters by responding to their recorded voice (which is her own). Amber, my guest for the evening, was thoroughly impressed by her full use of the Theatre Passe Muaille backspace, in particular the second level off stage right during the battle scene which gave that particular moment a lot of depth. The use of sound and lighting made the small space come to life and I have to hand it to lighting designer Randy Lee and sound designers Wesley McKenzie and Jakob Ehman for giving life to the space. Moments like Jeanne’s argument with her father, the battle scene, her interrogation in prison, and ultimately her fiery execution were greatly enhanced by their work. Unfortunately, there were a few moments that both Amber and I found were off-note in the production. Thorpe’s comical portrayal of the Dauphin (using a cartoon moustache) and his mistress (with a hot pink glove) didn’t seem to fit with the rest of the production and changed the pacing and the mood in a way that I found off-putting. And this may be me being entirely nitpicking, but the accent she used when portraying Robert de Baudricourt, the army commander, sounded far more Quebecois than Parisian. What stands out the most about the story of Joan of Arc is simply this young woman’s defiance and willingness to stand up for what she believed in during a time when that stood in direct opposition of the church. What Joan of Arc represented is timeless and Thorpe does fine work capturing this. On the particular night that I saw HERETIC, Paris was under attack by terrorists which makes the soul of this story so much more prevalent. HERETIC is playing at the Theatre Passe Muraille backspace (16 Ryerson Ave) until November 22. Performances are Wednesday to Saturday at 7:30 pm with weekend matinees (Saturday and Sunday) at 2 pm. Tickets range from $15-$22 and can be purchased online, by phone by calling 416 504 7529, or in person at the box office.